This accessible and invaluable workbook-style reference guide will help you smoothly make the transition from writing for composition classes to writing for psychology classes. 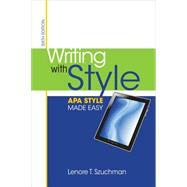 In WRITING WITH STYLE, Sixth Edition, author Lenore T. Szuchman quickly and succinctly provides the basics of style presented by the Sixth Edition of the APA's PUBLICATION MANUAL. Dr. Szuchman's years of experience teaching writing-intensive courses give her an inside track on the trouble spots students often encounter when writing papers and dealing with APA style. In this book, you'll learn how to avoid common errors and use the APA style with confidence.